Ah…Paris, the city of love, and the backdrop for Woody Allen’s new romantic comedy. He presents viewers with a picture-perfect postcard of the fairy-tale, breathtakingly beautiful city, as well as its world-renowned historical authors, artists and poets. 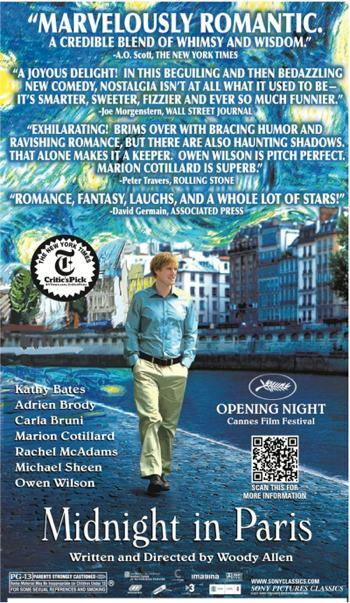 To say that Allen’s film is a love letter to Paris and its people, (he wrote the screenplay) is a fairly close assumption. Fasten your seat belt for a delightful cultural sight seeing tour of the city and its past luminaries that shaped our world. You’ll meet Ernest Hemingway (Corey Stoll), Gertrude Stein (Kathy Bates), F. Scott Fitzgerald (Tom Hiddleston), Salvador Dalí (Adrien Brody), and more. You might be wondering, how does this work? Well, that’s a secret you’ll discover on your own by viewing the film, but what I will tell you is that this film works. Gil (Owen Wilson, “Marley and Me” 2009) and his fiancée Inez (Rachel McAdams, “The Time Traveler’s Wife” 2009) decide to accompany Inez’s father John (Kurt Fuller) and mother, Helen (Mimi Kennedy) on a business trip to Paris. Upon arrival in Paris, Gil, a successful Hollywood screenwriter laments upon his professional life choices. His main regret centers on a missed opportunity. He never took advantage of his first visit to Paris in his early twenties and begins to fantasize about a new life, a rather − avant-garde lifestyle. Living among Parisians’ as a burgeoning novelist in a small flat begins to overtake his thoughts. On the other hand, Inez is caught up in Parisian antique shopping, Chanel and Hermes, and she envisions a new life in Beverly Hills complete with an outdoor swimming pool and large estate. Woody Allen, writer and director, presents a major conflict between the engaged couple from the get-go. Midway through the first quarter of the film, Gil begins to walk the streets at night alone. During these walks not only does he take in Paris’s intoxicating lights and city sounds, he’s magically transformed back into the early 1920s. When he returns to 2011, he doesn’t know how the occurrence happened nor does he seem to care. All we know is that he can’t wait to go back again and for that matter, neither can we. These time travel expeditions also start to crystallize his notion of staying in Paris and not returning to Beverly Hills. Allen’s script is witty, clever, fast-paced and, of course, filled with self-doubt. It also touches on neurotic behaviors that typically encompass his main character, which onscreen is a reflection of Woody Allen himself. Wilson is a perfect Woody Allen leading man, his timing and mannerism are spot on. Simply stated, the role fits him like a glove. The film begins with a montage of Parisian landmarks, glossy photos that are breathtaking. It makes no difference if you’ve been to Paris or not, the opening begins in silence and proceeds to a lone clarinet (Allen’s personal instrument of choice), that resonates a slow jazz melody, setting the mood for the remainder of the film. Deliberate in purpose, the stage is set perfectly for a special treat, one that indulges our senses and dares us not to be wooed. Next scene, the engaged couple steals a kiss on the famous green bridge in Monet’s garden. To say that the film swept me off my feet is the most accurate assessment that can be written at the moment. Of course, there are many talented co-stars who jumped at the chance to work with Allen, who, at age 75, has entertained us with over 40 films to date: Marion Cotillard, Adrien Brody, Kathy Bates and Michael Sheen. Not too surprisingly, the President of the French Republic’s wife also has onscreen time, Carla Bruni, playing a museum guide. Don’t miss the hysterical Picasso scene as Wilson attempts to impress Inez with an inside interpretation of the artist’s work. The Hemingway scenes are equally as comical as his normal speech pattern is as if he’s reciting one of his novels. Other surprise artists await the viewer near the end of the film, of which will not be made known by this reviewer. My suggestion – sit back, relax and enjoy this Woody Allen jewel. Bottom-line: A romantic comedy that boasts a clever and thought-provoking script. Academy Award winning stars, soothing musical score all set in the backdrop of Paris. Backstage Notes: My timing could not have been more fitting, as I had just finished reading the excellent book, “The Paris Wife” by Paula McLain a few days prior to viewing the film. The book is based on Ernest Hemingway’s first wife’s diaries and their life together in 1920s Paris. Paris did become a reality for me over ten years ago and I’ve visited many times since. The city’s architecture is my favorite aspect. Yes, the art galleries, gardens, cafes, food, champagne and sculptures all impress, but those intricate detailed French style buildings with deep blue roofs, wrought iron balconies, overflowing flower boxes and those amazingly endless vertical windows astonish me the most. I’d strongly suggest checking out every tour attraction in the film as well as the simple act of buying a baguette, wine and cheese and stroll along the Seine River. No worries about strolling too far to enjoy your picnic in a picturesque spot, as there are thousands of breathtaking views everywhere you look. Paris is a photographer’s paradise and a city that challenges you not to fall in love.